The unprecedented behind-the-scenes access captured an extraordinary moment in American politics. President Clinton's impeachment was big news everywhere. 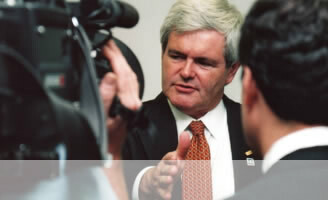 In September 1998, Newt Gingrich was one of the most powerful men in America. During the next six months, he led his party through a disappointing election and the impeachment of the President of the United States. Then he resigned and became a private citizen, while the President he battled remained in office. Our cameras followed Newt Gingrich behind the scenes during these tumultuous months. Narrated by Tony-award winner Blair Brown. This documentary benefits greatly from the unprecedented behind-the-scenes access. Political junkies won't want to miss this chapter of not-so-ancient history. The Fall of Newt Gingrich is available for purchase on DVD.